Of the shelf products to be used by large organisations. (Open source) tools for academic or commercial usage. 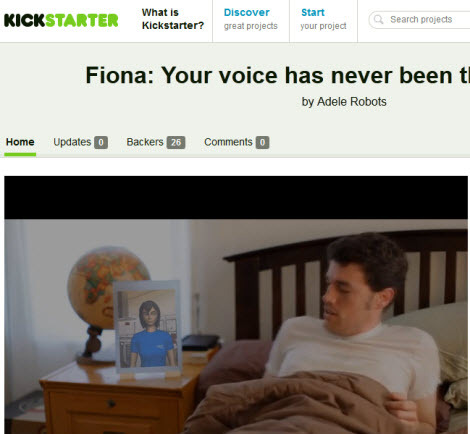 The Spanish company Adele Robots has launched a new project on Kickstarter, Fiona. Fiona creates a world where your electronics are an extension of your senses. The technology beyond Fiona is the platform with the same name (http://www.sparkingtogether.com). Living Actor™ Assistant: The First-Ever 3D Talking Virtual Assistant for Web Self-Service! Summary: The First-Ever 3D Talking Virtual Assistant for Web Self-Service, "all in one" service & pay for results! Cantoche, a company that develops and distributes avatar SaaS products, announced today the release of Living Actor™ Assistant, a 100% online intuitive and low-cost tool that easily authors interactive talking animated avatars who automatically answer Web visitors’ questions. Living Actor™ Assistant enables small and middle size businesses to increase customer conversion rates while reducing their services costs through the use of conversational virtual assistants. Read more about: Living Actor™ Assistant: The First-Ever 3D Talking Virtual Assistant for Web Self-Service! noHold, Inc., developer of the most interactive and diagnostic Virtual Assistant technology and Confederated Knowledge, announces that leading companies in Hi-Tech industries like PC, and networking are choosing to connect their Virtual Assistants via Confederated Knowledge. noHold creates Virtual Assistants for web based self-service that increase customer satisfaction, reduce support costs, and capture actionable customer intelligence. As products and services become increasingly interconnected, the need for support across company boundaries is imperative. Confederated Knowledge or CK, is a patent pending feature that allows one Virtual Assistant to connect with multiple Virtual Assistants. For example: When you have an issue with your PC, it could be related to the security software, a peripheral device or the Internet Service Provider (ISP). CK empowers you to start the conversation on your own terms and get answers from a network of interconnected Virtual Assistants. On November 1, 2011 I gave a talk to Google on natural language processing, including chatbot technology and issues in understanding simple English sentences for a story-game demo which tries to act out the sentences. Download the PDF or read full text below. I am an AI research engineer. I want to create things that people use, but that stretch the boundaries of the possible. Whatever I work on, I research it and then try to come at it with a fresh perspective. A fresh perspective is something Google and I have in common, though we approach things from opposite directions. Typically my fresh perspectives involve understanding a domain and then writing a new application-specific scripting language to encapsulate insights I have gleaned. Google’s perspectives come from access to massive amounts of data and hardware. I research everything. I even researched how to give this talk. I thought about making a lot of clever PowerPoint slides. Then I read up on using and abusing PowerPoint. I abandoned that plan. MyCyberTwin, a new generation of artificial intelligence technology, today announced the launch of its low cost Intelligent Virtual Agents (IVAs) to the small-medium business (SMB) and developer market. The latest product offering is designed for businesses to quickly and efficiently deploy state-of-the-art chat solutions across their web and social media properties. MyCyberTwin’s IVAs offer SMBs the ability to answer customer questions instantly and accurately, decrease staff costs, increase sales and customer engagement, and find out what customers are really thinking by capturing the analytics of the interaction. 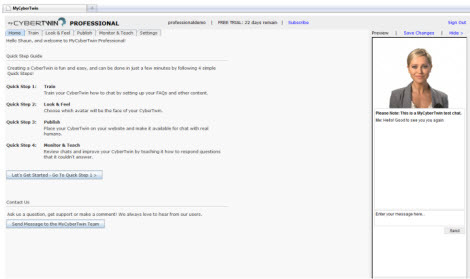 eGain Communications has just released Assistant 5.0, a conversational agent that can help Web site visitors search, solve problems and purchase items via typed exchanges in conversational English. Inbenta announces the launch of “Semantic Site Search”, a new service (SaaS-based) that provides search to any website within the cloud computing. After four years of development (project codename: voldemort), this search service includes Semantic Search capabilities and Natural Language Processing (NLP). Site owners will be able to easy-integrate Semantic Search engine on their site and their content. Other features include customization, XML ,API, and real-time reporting tools.